There's no experience quite like a once-in-a-lifetime chance to spend a morning on a private backside tour at Churchill Downs Racetrack. Your group will get a behind the scenes view of Thoroughbred racing at the "World's Most Legendary Racetrack.” Along with more than 1,400 stalls that are mostly all full during the peak season, enjoy breakfast in the Horsemen’s Track Kitchen, see the horses training rail side, catch them during a bath and learn about life at the track. 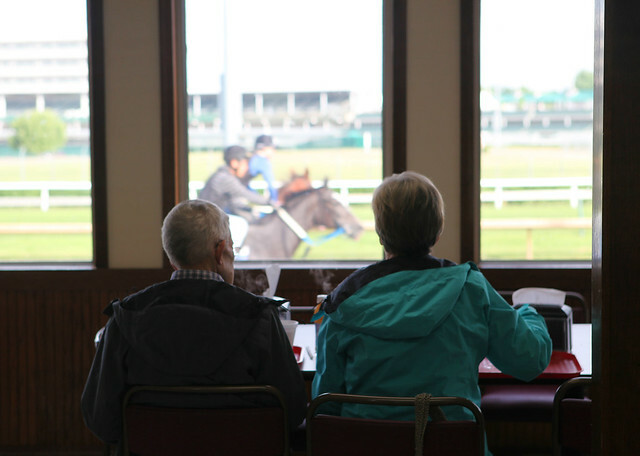 Be sure to bring your cameras because on any given day of training, visitors will get an up close and personal view of the horses, jockeys, trainers, and other connections who live the sport of horseracing! This tour is exclusive to groups visiting the Kentucky Derby Museum and not available to the general public. Substitutions or special requests are available for an additional cost. Tour available March - November at 7:00 a.m. or 8:30 a.m.
Add a Jockey Appearance to your Backstretch Breakfast Experience! For a first-hand perspective, add a jockey appearance to mix and mingle with your guests.